Another wonderful get-together in Rocky Mount, this time to pay tribute to one of wrestling greatest legends, Johnny Weaver. 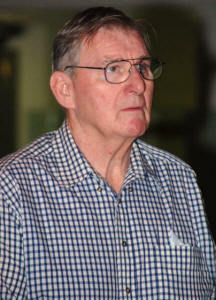 Weaver passed away February 15, 2008 at the age of 72. 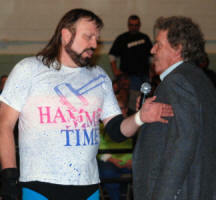 His daughter Wendi along with several of Weaver's peers from the 60s, 70s, and 80s gathered in Rocky Mount to pay tribute to him on the one year anniversary of his final appearance in a wrestling ring. 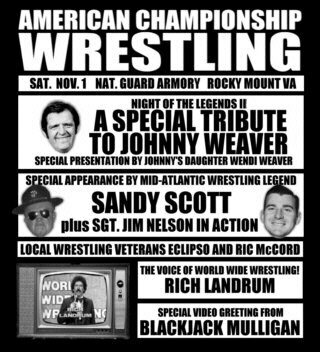 Exactly one year ago this weekend, Johnny Weaver appeared as part of a huge "Night of the Legends" event in Rocky Mount that featured Weaver along with Sandy Scott, Don Kernodle, Jim Nelson, Keith Larson (Rocky Kernodle), Ric McCord, and Eclipso. 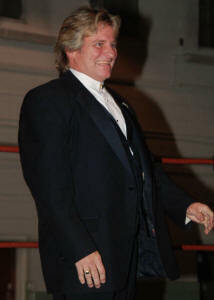 Weaver, still in excellent shape at the age of 72, hit the ring at the end of the show and locked on his famous trademark sleeper on bad guy Eclipso to end the show that night, much to the delight of the many fans. 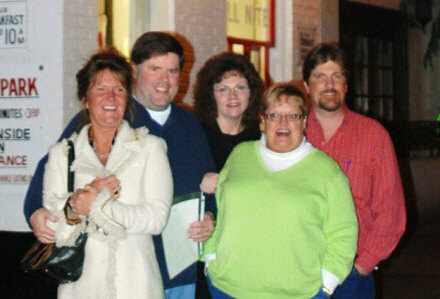 Friends and members of the Mid-Atlantic Mafia surprised Weaver after the show with a birthday party and special gathering. It was a special weekend for all those involved. (See photos and report here.) Little did we all know, it would be the last time many of us would see Johnny Weaver. 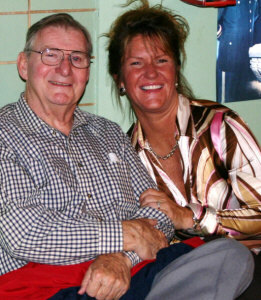 A few months later, Johnny passed away at his home in Charlotte NC. His death was unexpected; he had just recently passed his physical for the Mecklenburg County Sherriff's Department, where he was a deputy and was looking forward to retirement in less than two years. His death stunned his family, the wrestling community, friends, and long time fans. 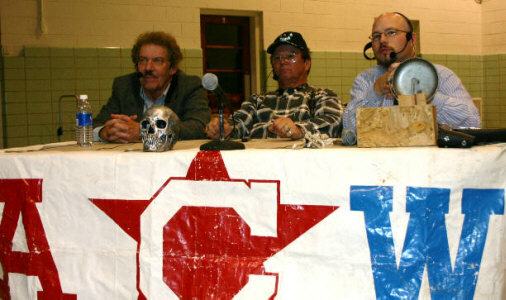 This 2008 event for ACW, called Night of the Legends II, was also a special tribute to Johnny Weaver, with many of the folks that worked with him both in the ring and behind the microphone in attendance to help honor him, including wrestling legend Sandy Scott and Johnny's first broadcast partner in the late 1970s Rich Landrum, who hosted World Wide Wrestling for Jim Crocket Promotions from 1978-1982. 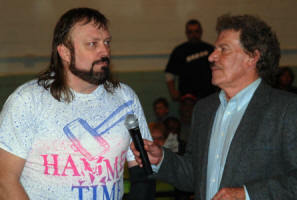 Landrum was the special announcer for the Weaver tribute, and even joined in commentary for the taping of the event. Weaver's close friend Blackjack Mulligan sent in a special video greeting to all the fans in Rocky Mount and offered his special tribute to Johnny as well. Area wrestling alumni appearing this year, as mentioned above, were Sandy Scott and Rich Landrum, as well as Jim Nelson and Eclipso (who both wrestled on the show), and Ric McCord. Local stars from the group that presented the event, American Championship Wrestling (ACW), included Hillbilly Helbert, Jamie Wright, NICW champion Ken Steel, manager Douglas J. Wentworth III, referee Ric Petty and many others. The special guest of the evening was Johnny's daughter Wendi Weaver. 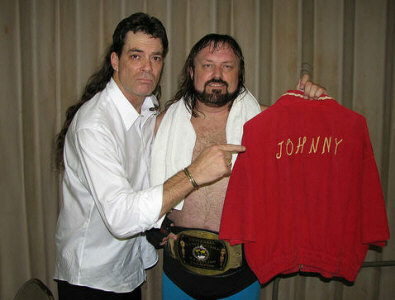 Wendi donated one of Johnny's ring jackets worn by Weaver in the 1960s and 1970s to be raffled off for the charity "We Care" of Franklin County, VA. The organization works with the disabled and under-privileged children in the area. Landrum introduced her to the nearly 200 fans in attendance, and Jim Nelson presented her with a special plaque honoring her father and thanking her for her participation in the event and contribution of her father's ring jacket. 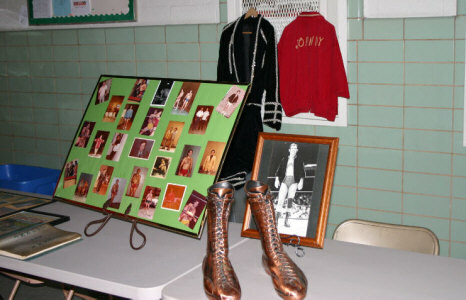 Special video presentations were shown throughout the evening including highlights from Johnny's career, a tribute prepared especially for that evening from Blackjack Mulligan, his 1978 win in Charlotte over Baron Von Raschke for the NWA TV title, and highlights from his famous "sleeper vs. claw" feud with Raschke. Mulligan's appearance on video got a huge pop from the crowd and nice ovation afterwards. We also want to remember Patricia (Pat) Jones who passed away on Monday October 27, 2008 - just five days before this show. 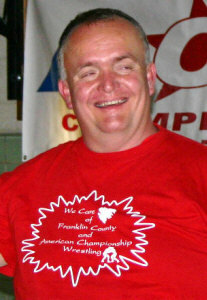 Pat was a big part of the NICW/ACW/Gateway wrestling family. She will be greatly missed. Our thoughts and prayers go out to her husband and our good friend Douglas (Chance) Jones as well as her family and friends. 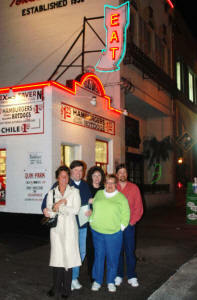 Thom Brewer has photos from the show on his Flickr page.